It's here. The book that I was dreading the most of all the 52 Country challenge--http://www.goodreads.com/book/show/7042.The_Tale_of_Genji. Why did I pick a 1100 page novel set in 8th century Japan? Well, I've been intrigued by the idea of reading what is often called the first novel ever written since I picked it up at Cody's Bookstore when I was a Sophomore in college. I knew, however, that I need a bit of background reading in order to even grasp the book on the most shallow level. I'd lived in Japan for a few years, so I had some sketchy background knowledge of the novel, though modern-day Tokyo has as much to do with ancient Heian culture as Earth has to do with Mars. That's not true--of course--a few echoes, such as the celebration of long-enduring festivals such as the tanabata and moon festivals, remain. And I had some experience with hiragana, the script that "Genji" was written in, as it is the first script that children (and foreigners) learn to read in Japan before moving on to the more difficult Chinese script (kanji). That's why warning signs (don't run in the train stations, don't touch electrical boxes) are always written in kanji and hiragana, so that children won't run in train stations, or touch electrical boxes. Which I sort of all ready knew not to do, but an extra reminder is always welcome. 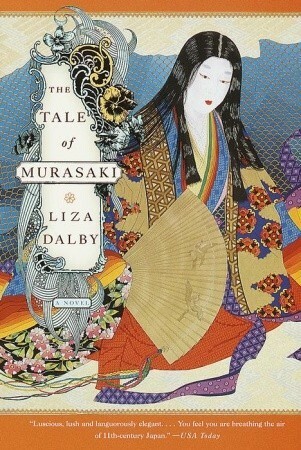 I had also read Liza Dalby's wonderful novel, http://www.goodreads.com/book/show/369669.The_Tale_of_Murasaki. Liza Dalby is one of the very few Western women who has trained as a geisha, and her novel, which is a first -person retelling of Murasaki's life, is full of people possessed by spirits, or trapped in houses as the auspices forbid any travelling towards, say, the west, and makes few concessions to the modern reader. It really captures the weirdness of a world that has utterly vanished. Well, not entirely. A few remnants of old Kyoto remain. The temple above is the original Byodo-in Temple on the outskirts of Kyoto, which stood at the time of Murasaki's novel. I wanted to visit it during our one visit to Kyoto, since we had lived next door (the temple on the right) to its replica in Hawaii. In Kaneohe, I heard the ancient gong at least a dozen times a day, as Japanese honeymooners would strike the bell for good luck. The temple peacocks actually seemed to spend more time in my yard than in the temple grounds; they would peck on the skylight roofs of my house during the frequent afternoon downpours (not the cleverest of birds, they never figured out that banging on the tempered glass would get them nowhere) and they would sneak inside the house if we didn't close the lanai door properly. Unfortunately, there was a sudden cloudburst (it seemed to be always raining in Japan) just as we were ready to drive to the temple and there was no way anyone in the family wanted to get soaked before an eight-hour car trip back to Tokyo. Well, it was always raining in the foothills of the Ko'olau Mountains, too--at least when the planners choose the site of the new temple in O'ahu, they got that right! Maybe I'll return one day to Kyoto and make a proper comparison of the two buildings. Well, this isn't my doll, as I gave my Heian doll to my mother, and in the haste to finish up my doll up right before we left Japan, I forgot to take photographs. But this is the very model that one of the Japanese women in my class was making for her exam doll so that she could be certified as a kimekomi instructor. The long, simply dressed hair, the many, many layers of kimono (true understated Japanese ostentation, as only an inch or so of each kimono would show) and the lack of a wide obi (sash) and back bow are marks of Heian costume. Trying to tuck each little shard of kimono silk or brocade into the composition wood without staining or stretching the material was a fiddly operation at best; at times I would throw down my little knife in despair and call for my sensei for a bit of help. Liza Dalby's novel, a trip to Kyoto, and a few months struggling with my doll didn't seem to be enough background to really understand Genji's world. While I was researching which translation to read, I saw several references to Ivan Morris's "The World of the Shining Prince", so I decided to read some non-fiction in preparation for the epic. Frankly, I wasn't expecting much. I thought I'd be plowing through a dry treatise with more of a sense of duty than enjoyment. To my surprise, I loved the book. It wasn't written with an insider's sense of exclusiveness (well, there was a bit of distracting Oxbridge-y loftiness as he threw around as many foreign language references--other than Japanese---as he could cram into the text, ) but was geared for the person who was interested in the culture, but didn't want to be overwhelmed by it. There was the necessary chapters on Chinese poetry, the bureaucratic structure of the government (copied from the Chinese and unnecessarily unwieldy for such as a small county as Japan), and clothing. Of particular interest to me were the chapters on the position of women and the lower classes in Japan. Women were actually highly valued in court--indeed the birth of a daughter was seen as fortunate as the birth of an heir, if not even more of a boon--as daughters were maneuvered into becoming empresses for the almost universally short-reigning emperors. I hadn't realized that even before the time of the Shogun, the position of emperor was almost inevitably a weak one. I also learned the upper classes (a highly rarefied bunch of people that numbered, at the royal court's peak, a mere 5,000) viewed the peasants as sub-human. Good thing I read that, or I would have viewed Murasaki's disdain for the "jabbering" of those people out beyond the shoji screens, as her own personal snooty shortcoming. My only problem with the book was a bit of squeamishness about homosexuality; he didn't seem to be eager to discuss this topic, and was rather dismissive of it. Perhaps a reflection of his own times, as Morris's book is fifty years old? An essential book for understanding the culture of 8th century Kyoto.